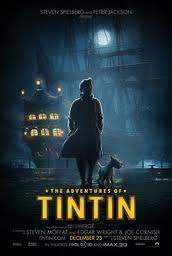 The Adventures of Tintin (Les Aventures de Tintin) is a series of classic comic books created by Belgian artist Georges Rémi (1907–1983), who wrote under the pen name of Hergé. The series is one of the most popular European comics of the 20th century, with translations published in more than 80 languages and more than 350 million copies of the books sold to date. With the recent The Adventure of Tintin film we take a look at Tintin Books & Tintin Collectibles. Pictured right: Tintin Book – Tintin in the Land of the Soviets (in the original French, Les Aventures de Tintin, reporter du “Petit Vingtième”, au pays des Soviets) is the first title in the comic book series The Adventures of Tintin, written and drawn by Belgian cartoonist Hergé (1907-1983). Originally serialised in the Belgian children’s newspaper supplement Le Petit Vingtième between 10 January 1929 and 8 May 1930, it was subsequently published in book form in 1930. 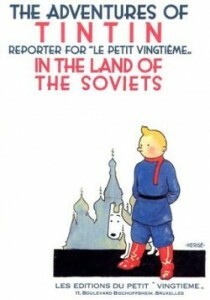 Designed to be a work of anti-Marxist and anti-socialist propaganda for children, it was commissioned by Hergé’s boss, the Abbé Norbert Wallez, who ran the right wing Roman Catholic weekly Le XXe Siècle in which Le Petit Vingtième was published. The series first appeared in French in Le Petit Vingtième, a children’s supplement to the Belgian newspaper Le XXe Siècle on 10 January 1929. The success of the series saw the serialised strips collected into a series of twenty-four albums, spun into a successful Tintin magazine, and adapted for film, radio, television and theatre. Set during a largely realistic 20th century, the hero of the series is Tintin, a young Belgian reporter. He is aided in his adventures from the beginning by his faithful fox terrier dog Snowy (Milou in French). 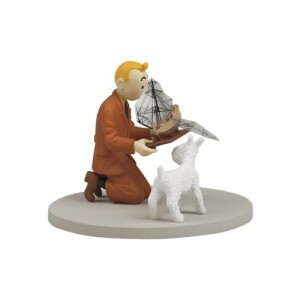 Pictured right: ABS Tintin Collectibles figurine showing the historic first meeting between Tintin and Captain Haddock, as featured on page 15 of The Crab with the Golden Claws. Each model is neatly presented within a Plexiglas cube, The high-quality finish of every character ensures that each tiny detail, movement and expression has been faithfully rendered to reproduce Hergé’s original drawings. Later, popular additions to the cast included the brash, cynical, grumpy and often drunk Captain Haddock, the highly intelligent but hearing-impaired Professor Calculus (Professeur Tournesol) and other supporting characters such as the incompetent detectives Thomson and Thompson, who can only be told apart by the cut of their moustaches, (Dupont et Dupond). Hergé himself features in several of the comics as a background character, as do his assistants in some instances. The comic strip series has long been admired for its clean, expressive drawings in Hergé’s signature ligne claire style. Its engaging, well-researched plots straddle a variety of genres: swashbuckling adventures with elements of fantasy, mysteries, political thrillers, and science fiction. The stories within the Tintin series always feature slapstick humour, accompanied in later albums by satire, and political and cultural commentary. AbeBooks.co.uk – find more than 110 million out-of-print books worldwide. Unlike us, bears have discovered the enviable secret of eternal youth.